Iveco (Industrial Vehicle Corporation) was founded on January 1, 1975 as a merger of five European companies. These five were: Fiat Industrial Vehicles from Turin (Italy), OM from Brescia (Italy), Lancia Special Vehicles from Bolzano (Italy), Unic from Trappes (France) and Magirus-Deutz from Ulm (Germany). The first official Iveco project was the Daily, which came on the market in 1978 and became known as a small industrial vehicle. Today, Iveco is member of the CNH Industrial Group company with 11 production sites in Europe, Asia, Africa, Oceania and Latin America. The Iveco Daily was the first official Iveco project. The first Daily was launched in 1978. Since then, the van has been constantly evolving. Not for nothing is the current Daily E6 advertised at Iveco as the best partner for your business. It has innovative technologies, combining comfort, safety and low operating costs to achieve even more efficient vehicle management. The Iveco Daily can be equipped with engines from 100 kW (136 hp) to 150 kW (205 hp). To ensure that these can be driven very efficiently, the Daily has the exclusive IVECO Driving Style Evaluation System (DSE), which serves as a driving coach and always informs the driver about current driving behavior and makes suggestions for improvement. In this way, up to 15% fuel can be saved. But the engines also contribute to the efficiency of the Iveco Daily. You can choose between 2.3 liter diesel engines or 3 liter engines. Among the 3 - liter engines is also a natural gas operated option to choose from. This one is based on a diesel engine and therefore offers the same performance and response as its diesel equivalent. Smooth and environmentally friendly operation makes this engine variant perfect for urban use (e.g. in traffic zones with entry restrictions). Among other things, the 8-speed automatic transmission of the new HI-MATIC transmission generation ensures maximum comfort and safety. Depending on requirements, the fuel consumption of this transmission can be optimized with the driving modes Eco and Power. In order to provide the best conditions for every application, the Daily is available in various dimensions. Overall, you can choose between 5 vehicle and load space lengths and 3 heights. Depending on the variant, the Daily has a load volume of 7.3 to 19.6 m³. To provide the necessary comfort in the driver's cab, the Daily E6 offers numerous options (DAB radio, comfort head restraints, leather steering wheel, numerous shelves, hydraulically sprung seat and much more). The Iveco Eurocargo attaches great importance to comfort and ergonomics. The driver's cab is not in vain referred to as a full-fledged and mobile office. With the multifunction steering wheel you can safely use the radio and telephone functions. In addition, the high-quality controls can control the air conditioning, the vehicle lighting and the automated or fully automatic transmission. With a capacity of 20 liters, laptop or tablet can be conveniently stored in the office module together with everyday items. It includes an LED reading light, magazine storage pockets and two USB ports. Upon request, an air-cushioned comfort seat is offered. In addition to a variety of adjustment options this offers a right-side armrest and seat heating and cooling. The Eurocargo provides a high level of safety with numerous safety systems such as Lane Departure Supervisor (LDWS), Electronic Stability Control (ESP), Emergency Brake Assist (AEBS) or Adaptive Cruise Control (ACC). For more efficiency, the Iveco Eurocargo has the ECOROLL function. This is available only in conjunction with the automated 12-speed gearbox. On downhill gradients, this function switches the powertrain to neutral and does not decelerate due to engine overrun. If the Eurocargo falls below a predefined speed, the engine automatically returns to drive mode. In this way, kinetic energy is exploited, thus reducing fuel consumption. With the ECOSWITCH function, which is available for all automated 6 and 12-speed gearboxes, the gearshift logic is matched to engine performance. The driver can easily activate this function with a switch. Then a speed limiter (85 km/h) is activated and the kickdown function is deactivated. In addition, the driver can no longer manually engage in the switching process. These new features reduce fuel consumption of the Eurocargo in urban distribution by up to 8%. With the Stralis, Iveco covers the area above the Eurocargo (with a permissible gross weight of 18 tonnes). The Stralis was introduced in 2002 as the successor to EuroStar and EuroTech. In 2003 he received the Truck of the Year award. Since then, the Stralis is constantly evolving and improving. The current range offers a wide range of integrated cost control and reduction features unique in its class. Depending on the type of application and the transport industry, Iveco promises that the Stralis can offer more than a million kilometers and more. The driver gets the Stralis modern technologies and powerful engines that guarantee a high level of efficiency and low fuel consumption. The powertrain has also been completely redesigned for the new Stralis. According to Iveco, it offers the best transmission in its class, a new rear suspension and state-of-the-art GPS capabilities for predictive driving. The Stralis is mainly used for urban and regional transport as well as dangerous goods transport. The cabin variants HI-STREET and HI-ROAD offer the driver enormous comfort for short and medium distances. In addition, the Stralis can be equipped with numerous low-emission and high-torque motors. In terms of power, these range from 228 kW (310 hp) to 420 kW (570 hp). The Stralis is equipped with the patented HI-SCR system. This selective catalytic reduction (SCR) system is considered to be the best of its kind on the market. It can reduce NOx emissions by up to 97%, meeting the requirements of the Euro VI emissions standard. The HI-SCR ensures maximum safety thanks to low exhaust gas temperatures and optimum combustion, especially for use at airports, in refineries or refueling areas. It also extends maintenance intervals, significantly improving availability, and optimizes fuel efficiency by increasing profitability through lighter weight (higher payload), longer maintenance intervals, and eliminating unwanted down times associated with forced regeneration. In addition, when used in long-distance transport, significant fuel savings can be recorded. The Iveco Stralis NP (Natural Power) was introduced as an alternative to the diesel-powered trucks of the Stralis series. He is running on natural gas and is said his diesel-powered brothers in terms of performance; Payload and versatility are in no way inferior. The Stralis NP has a 294 kW (460 hp) engine that delivers the same payload as a comparable diesel truck. The range of up to 1,500 kilometers (in the LNG variant) makes it possible, for example, to travel from Madrid to Frankfurt without refueling. Furthermore, the Stralis NP series trucks are not affected by the upcoming tightening of diesel vehicles, such as city center traffic. This type of clean vehicle is in demand all over Europe. Whether in retail, the energy sector, the automotive industry or the food industry, everywhere the number of used clean vehicles is increasing. This is mainly because the emission levels of natural gas engines are approaching zero. Iveco reports for the Stralis NP 70% less nitrogen oxides, 99% less soot particles and 90% less methane-free HC than required by the Euro VI standard. This contributes significantly to improved air quality. The Stralis NP emits about 15%, with biomethane operation even up to 95%, less carbon dioxide than a comparable diesel vehicle. Also, the natural gas engines are quieter and are therefore well suited for, for example, the night delivery in city centers. To make these benefits even easier to use, the expansion of the gas supply network is being promoted by European officials. By 2025, CNG (Compressed Natural Gas) filling stations will be available every 150 kilometers and LNG (Liquefied Natural Gas) filling stations every 400 kilometers. The Iveco Stralis X-Way can be used for a variety of purposes. The typical tasks include, among other things, operations as concrete mixer, dump truck, roll-off and skip dump truck, construction material transport, dump truck or timber transport. For this Iveco truck, there are three different FPT engine types (Cursor 9, Cursor 11 and Cursor 13) available with a total of nine power levels from 228 kW (310 hp) to 420 kw (570 hp). The three engines have a displacement of 8.7 (Cursor 9), 11.1 (Cursor 11) and 12.9 (Cursor 13) liters. The X-Way version of the Stralis also has exhaust aftertreatment with the HI-SCR system. The integrated HI-CRUISE drive system in conjunction with the Intelligent Auxiliary Controls ensures fuel savings during road operations. The Smart EGR function also helps to save costs by optimizing the injection periods and thus increasing the peak pressure in the cylinder. Due to the low circulation of the exhaust gases at certain engine loads less NOx is formed. Auto-idling prevents long idle time because the Stralis X-Way's engine shuts off automatically after a predetermined amount of time, as soon as the provided conditions are met. A total of 3 different cabins are available for the Stralis X-Way. On the one hand, the short Active Day (AD) cabin, which is particularly suitable for urban use, and on the other the Active Time (AT) sleeping compartment, which is designed for regional use, and the Active Space (AS) sleeping cabin for long-distance use. The Stralis XP was specially designed for long-distance use. It was premiered in 2016 and is also known as TCO2 Champion. He has a completely new vehicle concept and a large number of IVECO services. This reduces the total cost of ownership and CO2 emissions. In addition, it is equipped with the SMART EGR system, which improves combustion efficiency, HI-CRUISE, which includes various driver assistance systems, and EcoSwitch. The latter ensures a load-dependent drive control. In addition, Iveco offers the UPTIME warranty and various fuel consulting services. Overall, with the Stralis XP, a reduction in the total cost of ownership of long-distance transport of 5.6% is possible. Iveco also offers its own fleet management program. This allows the fleet operator to control the route of his vehicle and its status in real time via the FleetVisior portal. This program is available in different contract levels. With the bronze package, the vehicle can be tracked on the map and you get an overview of the fuel consumption. The Silver package also includes a fuel consumption report, vehicle and driver data analysis, and an overview of the driver's driving and resting times. The gold package covers all these features as well. It also offers a job management / workflow and enables the exchange of information with the back office. Optional services include frequent positioning, web-based driving-style reports and remote download of digital tacho data. In order to create a pleasant atmosphere inside the cabin, the Stralis XP has installed modern technology. These include, among others, the new HI-SOUND audio system and HI-VISION. For extra comfort, the materials used are tailored to the demands of everyday work in the Stralis XP, as well as a folding table and a coffee machine. 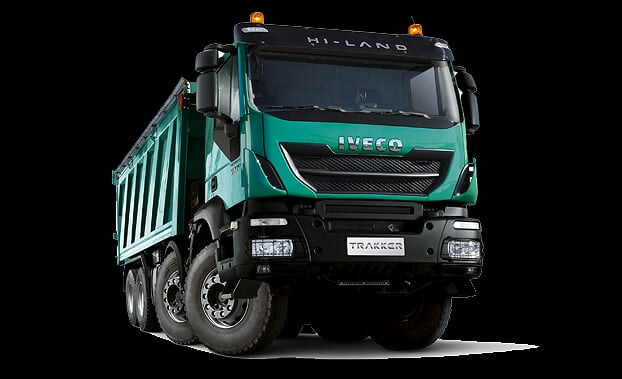 The Iveco Trakker is a truck especially for heavy construction site and off-road use. He is considered particularly robust and reliable. It is equipped with either a Cursor 9 or Cursor 13 engine. For the trakker a total of seven different power levels from 228 kW (310 hp) to 368 kW (500 hp) are available. The Cursor 9 engines are all Euro VI compliant and available with a wastegate valve. They have a displacement of 8.7 liters. The Cursor 13 motors are designed specifically for demanding applications. The most powerful variant with 500 hp also has a variable turbocharger geometry. The Cursor 13 engines also meet the requirements for the Euro VI standard. The Iveco Trakker is available with INTARDER, a wear-free retarder brake, which has a positive effect on maintenance and wear. The Trakker offers HI-RELIABILITY. It has an extremely sturdy chassis made of torsion-resistant and high-strength fine-grained steel as well as manual or automatic transmissions with 9, 12 or 16 gears. Another plus point is the decompression engine brake (Super Engine Brake). In addition to its robust inner values, the Trakker also has a robust new design. The bumper line has been optimized and the overall design looks elegant and functional. Its reliability and robustness have been proven by the Iveco Trakker several times. In 2012 and 2016, the Trakker won the Dakar Rally, the world's toughest rally. Nevertheless, no deductions have to be made in the area of ​​comfort. Iveco has equipped the Trakker with an ergonomic dashboard with easy-to-reach switches, easy-to-access controls and an adjustable steering wheel. There are also three different cab options available.